Whenever I get asked keeper-related fantasy football questions I always have the same answer – lean toward whoever is higher in ADP, unless you significantly prefer one player to another. For instance, if you’re choosing between Jarvis Landry, Sammy Watkins, and Carson Wentz, and have them all ranked somewhat equally, take the player who is most expensive (Landry, a full round higher by ADP). This way you may still be able to acquire one of the other players but at a cheaper cost. However, this advice is strictly limited to leagues with a draft penalty (you lose a draft pick in whichever round you selected that player last year). In leagues without a draft penalty, I typically just defer to my rankings (except in the rare case I have a player ranked well above their ADP). If you’re in one such draft this year, let this article serve as your guide. 1. Todd Gurley, RB, Los Angeles Rams – Gurley led all players at all positions in fantasy points per game in 2017 (25.6). Excluding Week 17, this was the 14th-most total fantasy points scored by any player at any position all-time. 2. Le’Veon Bell, RB, Pittsburgh Steelers – Bell’s volume was better than Gurley’s last year and he has a larger sample of dominance, but he’s also in the middle of a camp holdout. 3. David Johnson, RB, Arizona Cardinals – Johnson totaled 407.8 fantasy points in 2016, the ninth-most by any running back all-time – a number no other active running back has ever eclipsed. 4. 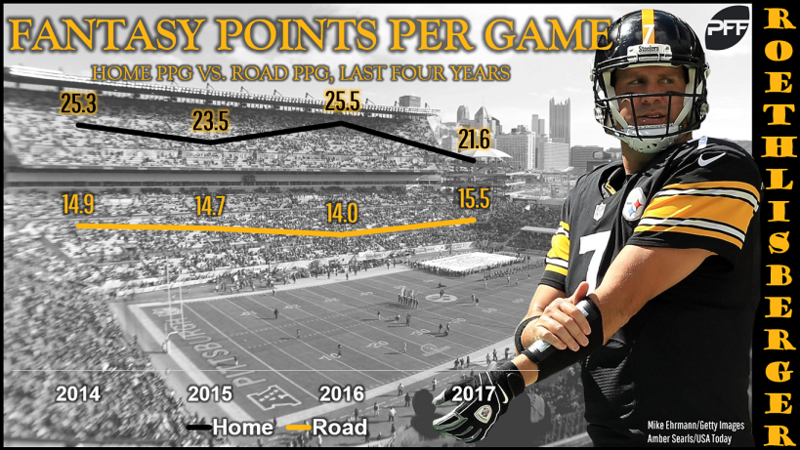 Antonio Brown, WR, Pittsburgh Steelers – Brown has finished first at his position in fantasy points per game in each of the past three seasons. He finished second in 2014, but his 23.8 fantasy points per game that year still ranks top-10 all-time. 5. DeAndre Hopkins, WR, Houston Texans – Hopkins led the position in fantasy points scored last year, despite drawing 57 percent of his targets from T.J. Yates and Tom Savage. Now he should get Deshaun Watson for the whole year. 6. Ezekiel Elliott, RB, Dallas Cowboys – Elliott is a solid bet to lead the league in rushing yards and rushing fantasy points. Target volume will be the key in him untapping Gurley/Bell-esque potential, as I outlined here. 7. Alvin Kamara, RB, New Orleans Saints – Kamara just put together one of the most efficient fantasy seasons of all time. Volume is a concern but should at least improve during the four games Ingram is suspended. 8. Odell Beckham Jr., WR, New York Giants – Among wide receivers, only Brown has averaged more fantasy points per game over the past four seasons (21.0). 9. Kareem Hunt, RB, Kansas City Chiefs – Hunt was uniquely efficient in college and then just as dominant in his rookie year. Volume might be better next year, even with Spencer Ware returning, as outlined here. 10. Julio Jones, WR, Atlanta Falcons – Jones ranks second among all non-quarterbacks in fantasy points since 2014. He had a down year last year but is due for regression, scoring seven touchdowns fewer than his expectation. 11. Michael Thomas, WR, New Orleans Saints – Thomas was our second-highest-graded wide receiver last year and now ranks second among wide receivers in fantasy points over the past two seasons. 12. Keenan Allen, WR, Los Angeles Chargers – Over the final seven weeks of last season, Allen led the position and averaged 23.9 fantasy points per game. Volume might be just as good this year, with Hunter Henry now out for the year. 13. Dalvin Cook, RB, Minnesota Vikings – On a small enough sample, Cook was our fourth-highest-graded runner last year and ranked seventh in yards per carry (4.78), and 10th in PFF elusive rating (56.1). Despite these numbers being skewed by Cook leaving his final game early in the third quarter, he also ranked ninth in fantasy points per game (16.9) and sixth in opportunities per game (22.5). 14. Melvin Gordon, RB, Los Angeles Chargers – Gordon is one of only two running backs (along with Le’Veon Bell and Ezekiel Elliott) to rank top-six in fantasy points per game in each of the past two seasons. 15. Leonard Fournette, RB, Jacksonville Jaguars – Fournette ranked third in touches per game (23.4) last year on the league’s most run-heavy offense. I see little reason why that should decline, and Jacksonville’s elite defense should mean plenty of scoring opportunities for Fournette. 16. Jerick McKinnon, RB, San Francisco 49ers – Carlos Hyde ranked 11th in carries and fifth in targets despite grading out 50th of 58 qualifying running backs. McKinnon is now the sixth-highest-paid running back in the NFL and the offense should take a step forward with a full year of Jimmy Garoppolo under center. 17. Christian McCaffrey, RB, Carolina Panthers – McCaffrey is one of just 19 running backs to ever see 100 carries and 100 targets in a single season. Rushing volume should improve (per coaches) as should efficiency (per me, based on college production and lighter fronts). 18. A.J. 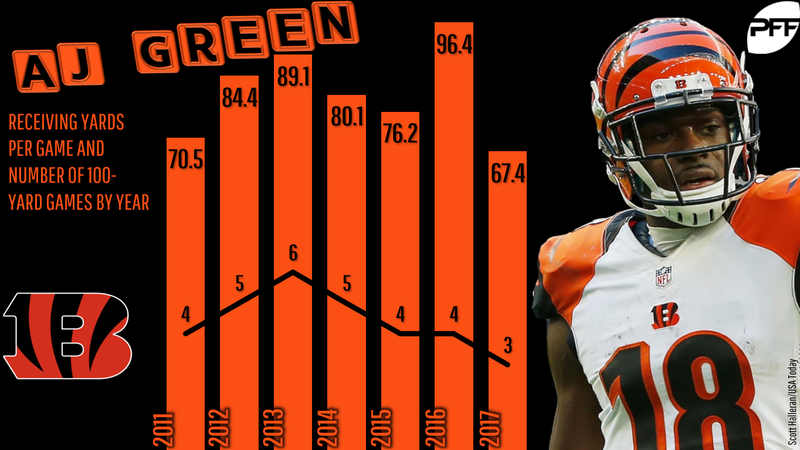 Green, WR, Cincinnati Bengals – Green took a slight step back last year (as did the entire offense) but would have ranked first among wide receivers in fantasy points per game in 2016 if we excluded a two-snap performance in Week 11. 19. Mike Evans, WR, Tampa Bay Buccaneers – Evans has seen 120-plus targets and has hit 1,000-plus yards in every year of his career. This also includes two of four seasons with 12 touchdowns. 20. Rob Gronkowski, TE, New England Patriots – If I was guaranteed a full 16-game season I’d take Gronkowski in the first round. His production, efficiency, and volume are unparalleled for a TE and he averages more fantasy points per game (over the past four seasons or throughout his career) than many of the wide receivers ranked above him. 21. Davante Adams, WR, Green Bay Packers – Adams is now the eighth-highest-paid wide receiver in the NFL, should see more volume with Jordy Nelson out of the picture, and ranked ninth in fantasy points per game last year (despite drawing 61 percent of his targets from Brett Hundley). 22. Doug Baldwin, WR, Seattle Seahawks – The league’s most-efficient fantasy wide receiver is now a great bet to reach a new career-high in targets. 23. Devonta Freeman, RB, Atlanta Falcons – Mark Ingram and Todd Gurley are the only other running backs to rank top-15 in fantasy points in each of the past three seasons. It’s a committee in Atlanta but Freeman’s volume will still be better than all but a few other running backs. 24. Kenyan Drake, RB, Miami Dolphins – Drake quietly put together a historically efficient season and Adam Gase’s RB1s have been extremely valuable for fantasy throughout his coaching career, as outlined here. 25. Adam Thielen, WR, Minnesota Vikings – Thielen burst onto the scene last year, ranking fifth in receiving yards and 10th in PFF Grade. But it was little surprise to me after a historically efficient 2016 season. 28. LeSean McCoy, RB, Buffalo Bills – If there was no risk of a suspension or getting placed on the Commissioner’s Exempt List he’d rank at least 10 spots higher. 31. Larry Fitzgerald, WR, Arizona Cardinals – Fitzgerald ranks fifth, seventh, and ninth among wide receivers in fantasy points over the past three seasons. Sam Bradford has targeted slot wide receivers on 24.8 percent of his aimed throws since entering the league, or fourth-most over this stretch. 32. Demaryius Thomas, WR, Denver Broncos – Thomas ranks ninth in fantasy points over the past three seasons despite Denver ranking second-worst in team passer rating over this stretch. The acquisition of Case Keenum means, at least, things shouldn’t be any worse than they were last year, when he finished 22nd in fantasy points. 38. Zach Ertz, TE, Philadelphia Eagles – Ertz averages 16.1 fantasy points per game across his last 16 games (playing on at least 25 percent of the team’s snaps). That would have ranked ninth among wide receivers last year. 39. T.Y. Hilton, WR, Indianapolis Colts – Hilton would jump at least 12 spots if Luck is confirmed ready to go for Week 1. 42. Josh Gordon, WR, Cleveland Browns – Gordon ranked 28th for me before announcing he would not show up for camp. 47. Emmanuel Sanders, WR, Denver Broncos – I’m higher on Sanders than most for the same reason as outlined in the Thomas section, but also because so many are forgetting he played hurt last year. Outlined here. 49. Robert Woods, WR, Los Angeles Rams – From Week 3 until the end of the postseason, Woods averaged 16.1 fantasy points per game, or what would have ranked seventh at the position. 56. Aaron Rodgers, QB, Green Bay Packers – Our first quarterback on the list. It’s a great year to go “late-round QB” but Rodgers offers unparalleled safety, finishing first or second in fantasy points in seven of his last eight healthy seasons. 59. Pierre Garcon, WR, San Francisco 49ers – Am I the only one who remembers that Garcon ranked fifth in targets (61) before a season-ending neck injury suffered in Week 8? He’ll also get a solid efficiency boost from the upgrade to Jimmy Garroppolo under center. 66. Will Fuller, WR, Houston Texans – Fuller ranked second among wide receivers in fantasy points per game (21.1) during the weeks Deshaun Watson was active. 68. Rex Burkhead, RB, New England Patriots – In the final six games Burkhead started and finished last year, he averaged 16.5 fantasy points per game. This would have ranked 10th-best at the position if over a full season. 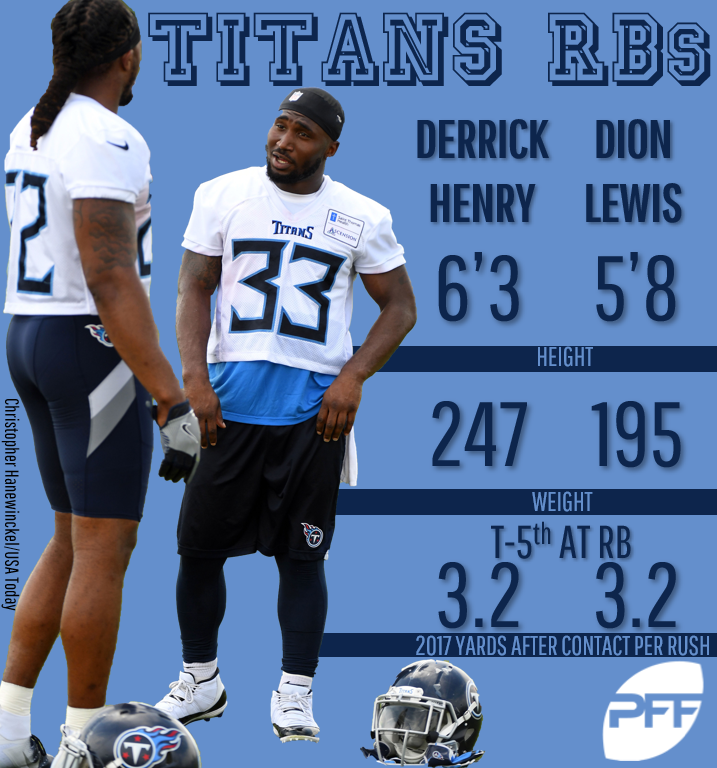 Keep in mind, Dion Lewis (now in Tennessee) was active in all of these games. 73. DeVante Parker, WR, Miami Dolphins – Parker dealt with injuries and a brutal cornerback schedule last year (and throughout the majority of his career) and Jarvis Landry leaves behind 161 targets in the wake of his departure. 75. Drew Brees, QB, New Orleans Saints – Brees was a lot better last year than anyone is giving him credit for. He’s due for a bounceback. 78. Deshaun Watson, QB, Houston Texans – Watson is due for a massive regression, even excluding the small-sample and the fact that teams now have seven games of tape on him, but he also put together a historic fantasy season last year. 80. Jordan Reed, TE, Washington Redskins – The only other tight end who can compete with Gronkowski when he’s on the field. 85. Aaron Jones, RB, Green Bay Packers – Jones averaged 5.53 yards per carry last season (on 81 carries) while his fellow Green Bay running backs combined for just 3.62 yards per carry. 98. Ben Roethlisberger, QB, Pittsburgh Steelers – He’s a lock to finish as a QB1 and maybe the No. 1 QB if you only start him when he’s playing at home. 100. Josh Doctson, WR, Washington Redskins – Doctson has sky-high touchdown potential. A league-leading 22 of his 78 career targets have come in the end zone and now his coaches are saying they want to get him even more involved in the red zone. 101. Andrew Luck, QB, Indianapolis Colts – Please come back. We miss you. 111. Tyler Eifert, TE, Cincinnati Bengals – Please stay healthy. 121. Marcus Mariota, QB, Tennessee Titans – Mariota was a lot better last year than you would have expected. 126. Matt Breida, RB, San Francisco 49ers – Jerick McKinnon is an RB1 lock if he gets Carlos Hyde’s 2016 volume, but McKinnon’s recent and career efficiency numbers suggest that might not be deserving. Since 2000, only Melvin Gordon averaged more yards per carry than Breida did in college (6.9). 128. 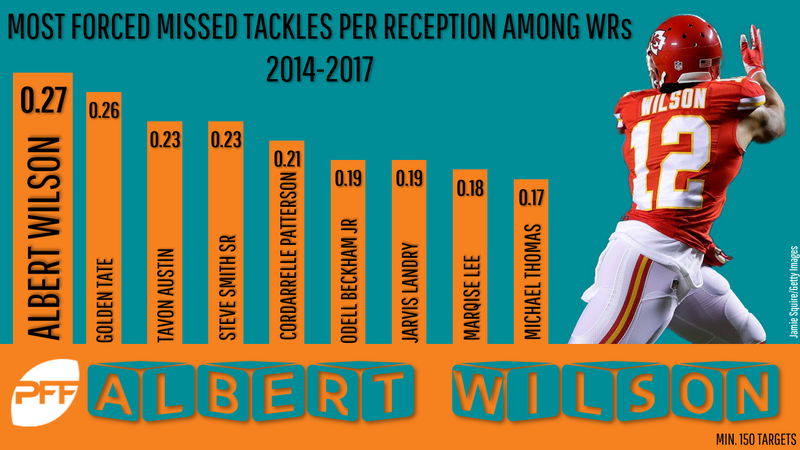 Albert Wilson, WR, Miami Dolphins – I have a man-crush on Wilson, but he’s worth pairing with Danny Amendola in case I’m wrong. 129. Jameis Winston, QB, Tampa Bay Buccaneers – Winston averaged 306.9 yards per game in the 11 games he played on at least 50 percent of his team’s snaps last year. He’s much higher in my rankings but you could probably draft him in the last few rounds alongside Tyrod Taylor and be set at the position. 134. Dak Prescott, QB, Dallas Cowboys – Despite losing Jason Witten and Dez Bryant, Prescott should rebound nicely from his sophomore slump. 138. Chris Ivory, RB, Buffalo Bills – Ivory’s ranking here is almost entirely tied to LeSean McCoy’s suspension risk. 143. Terrelle Pryor, WR, New York Jets – Pryor played hurt all year but posted 1,000 receiving yards in 2016 – just his first full season ever playing the position. 144. David Njoku, TE, Cleveland Browns – Tight ends typically take a significant step forward in their sophomore years and Njoku played much better last year than his stats might imply. 147. Patrick Mahomes, QB, Kansas City Chiefs – Either multiple skill-position players on the Chiefs are grossly undervalued, or we’re way too low on Mahomes.